I’m often asked about how I started working at Google, so it’s about time I tell the story in a blog post. 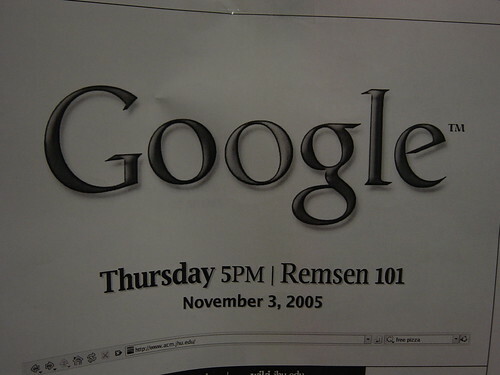 A couple of Googlers (Google employees) visited JHU in November 2005, and even though I wasn’t an engineer, I went to their talk just because I was interested in the company. I enjoyed the presentation, but I don’t think I even left my contact information since I assumed there wouldn’t be any positions there that would fit my skills. Sometime in the spring, Bill (my roommate), a CS major, heard about an opening in Search Quality at Google. He was going to be staying in school, so he passed the information along to me. While the job had some technical requirements, it was more focused on analytical skills and knowledge of the industry than raw coding abilities, so I applied. Before leaving for the airport, I printed out almost every page linked to from the About Google page so I could study it on the plane. I read it all. I can clearly remember almost every detail about my short visit to the Bay Area. I arrived the night before at the San Jose airport, where I was taken by a friendly cab driver to my hotel. Riding up 101, I remember looking out the window and seeing signs for famous technology companies. I couldn’t believe that they were all right there. We quickly arrived at the Hotel Avante in Mountain View. I completed the application, reviewed my printouts, and went to bed. 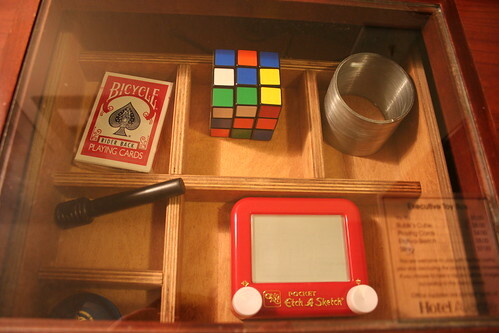 Leave it to Google to book a room in a hotel that provides guests with toys. I woke up early (which almost never happens, even when the time difference is in my favor), and it’s a good thing I did. I spent the next 45 minutes putting on my tie. It wasn’t the very first time I had attempted to tie a tie myself, but I certainly didn’t have a ton of experience. Finally, just as I knew I was running out of time and was preparing to go in without a tie (which I now know wouldn’t have been a big deal at all), I was able to get it. By this time it was too late for breakfast, and I took a cab to Google. I arrived early for my interview, and have a vivid memory of sitting in the lobby while I waited. I can recall some queries that scrolled by on a projection screen. I remember what the receptionist was talking about on the phone. I remember seeing a chef walk by, and I know I drank an orange Naked Juice from the lobby refrigerator as I looked at the newspapers on the table to pass the time. Oh, and the lava lamps! There were huge lava lamps that must have been turned on right before I arrived, since the wax inside wasn’t moving yet. When I went back to the lobby (with a new Google notebook and t-shirt! ), the wax in the lava lamp had done its initial rise, creating that lava tower that it does, but hadn’t actually gotten to the point where it separated into spheres that moved up and down. I think that the lamps probably hit their stride a few minutes before being turned off for the day. The receptionist called a cab for me and I was soon back at the hotel. I walked down the street to a nearby Pizza Hut for lunch. It felt a little weird eating there in a suit. And I didn’t realize it at the time, but it was actually weird for me to even walk down the sidewalk in a suit. Nobody wears a suit in California. 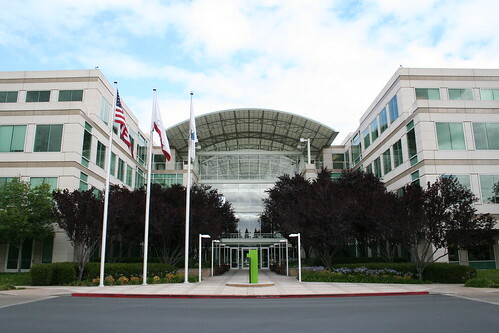 After lunch, I took a cab to Apple’s headquarters, and of course I had the address memorized. Even though I was happy with the morning’s interviews, I was still running under the assumption that I wouldn’t be coming back to Silicon Valley anytime soon, and wanted to get in a bit of sightseeing. I wasn’t able to see much of the campus as an outsider (I’d have the privilege of going inside later thanks to Skip), but I did pick up some items at the Company Store, where I almost dropped my camera at the register. I can’t remember if this was before or after I was asked if I was an employee. Shortly after I arrived home, the recruiter called me back and I was offered a temporary position (6 month assignment), and I accepted it, moving out to California for the job. When I wasn’t assembling IKEA furniture, I spent most of my time after work learning about Google, so I could satisfy my curiosity and also feel confident that I’d know what people were talking about at work. I read blog posts, subscribed to industry podcasts, and watched every video I could find of talks from Google leaders. I continue to do this today. 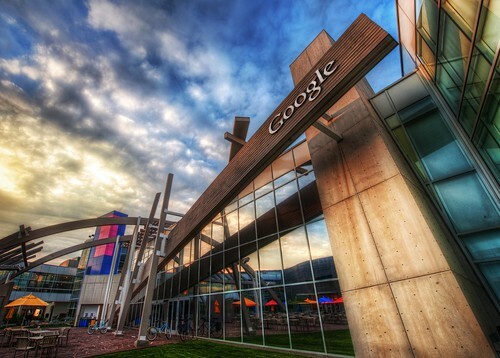 A few months into the work, I liked Google and Google liked me, so I applied for a permanent position and was hired. I’ve been working on search quality the entire time, and now focus on communicating with webmasters to help improve their sites, which improves Google’s index. Of all the companies I applied to, Google was the only one that granted me an interview. In fact, they were one of only a couple that actually gave me any reply whatsoever. I got a C in course called “Internet.” You have to admit that this is pretty hilarious. Congrats… maybe you can make them a better company now? You know what else I miss? @Reid – I was surprised too, I wear a tie even more rarely than Wysz and that’s what I do. I can’t believe Wysz would do anything without doing a Google search first. @Wysz – I remember thinking the same thing about the Hotel Avante. A friend of mine just interviewed but they put him up in some other random hotel, lame. Previous Previous post: Hello, Vancouver. I’m from the Internet.